I would love to have funding for or see an organization print some of these (or similar) as postcards or business cards, with an info link or two on the back, so they could be given out freely. Clean, pollutant-free air is good for all of us. 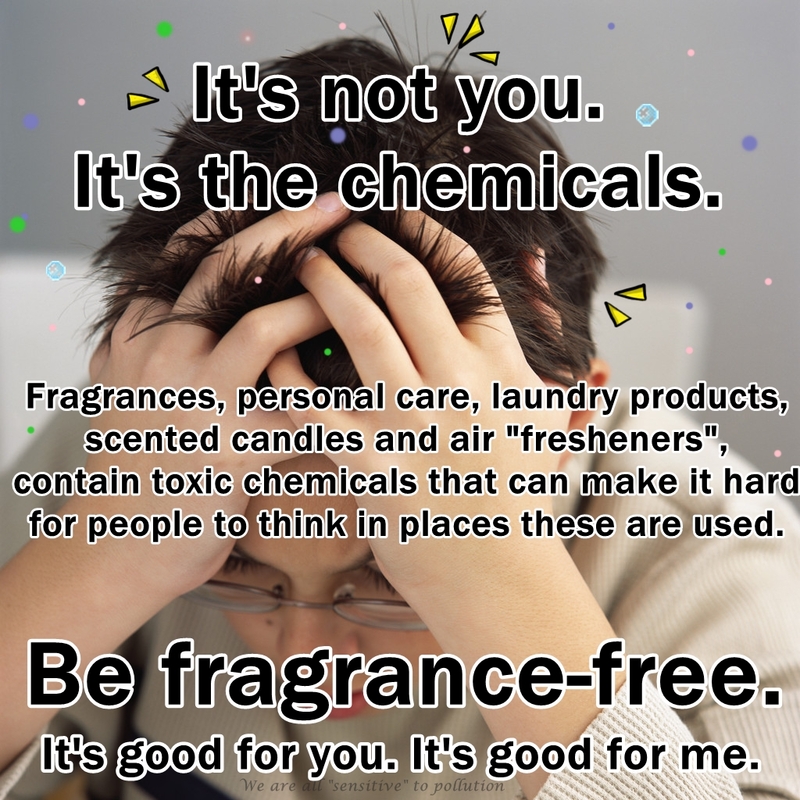 This entry was posted in Accessibility, Brain, Disability, Fragrance, Indoor Air Quality, Public Health and tagged allergies, asthma, be fragrance-free, brain fog, fragrance-free, hazardous air pollutants, headaches, health, images, It's not personal, It's not you, it's the chemicals, MCS, MCS/ES, migraines, petrochemicals, phthalates, poor concentration, toxic chemicals, toxic trespass. Bookmark the permalink. Great ideas. Thanks for making the air a little cleaner today. I can really understand the reaction people have to this – smell is such a powerful thing! 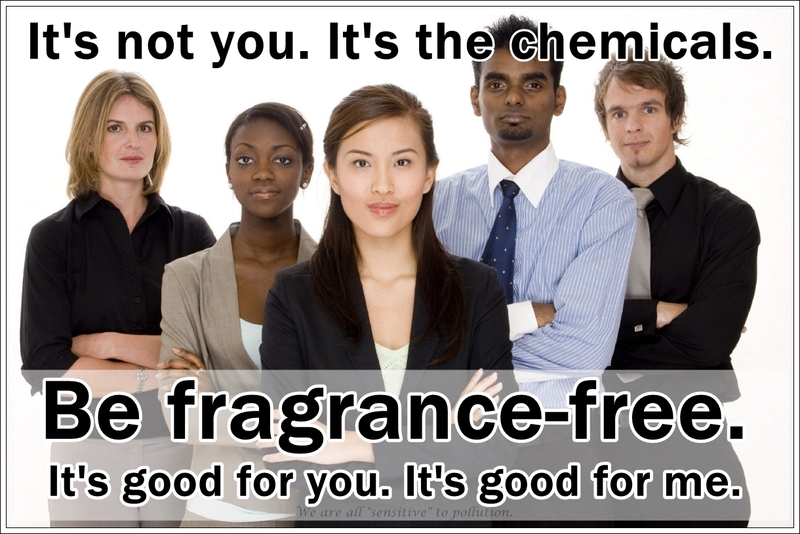 When I was told I was allergic to fragrance it took me about 6 months before I could face not wearing it every day. And another 4 months before I could stop wearing it on ‘special occasions’. It was like letting a part of myself go – I loved the way I smelt – I wore perfume every day and had several sorts depending on what mood I was in that day. Well done for spreading the message about this tricky topic – awareness has to come before understanding and acceptance. Thanks Claire, and sorry you’ve had problems because of fragrances too. There was a day when they were made of harmless substances from the earth, but that changed, and now most fragrances are petroleum based. I suspect it’s the petrochemicals that affect us in ways that cause more allergies to natural substances now too. In 2014, when this post was created, essential oils had not yet become pervasive in public space, so they were not included. Essential oils are NOT benign, and they ARE accessibility barriers. Don’t share your meds if you use them medicinally. Don’t use them in public spaces where they become accessibility barriers or in ways that you transport them into public on your body and clothing. They also emit hazardous VOCs which combine with other pollutants to create smog that harms everyone. 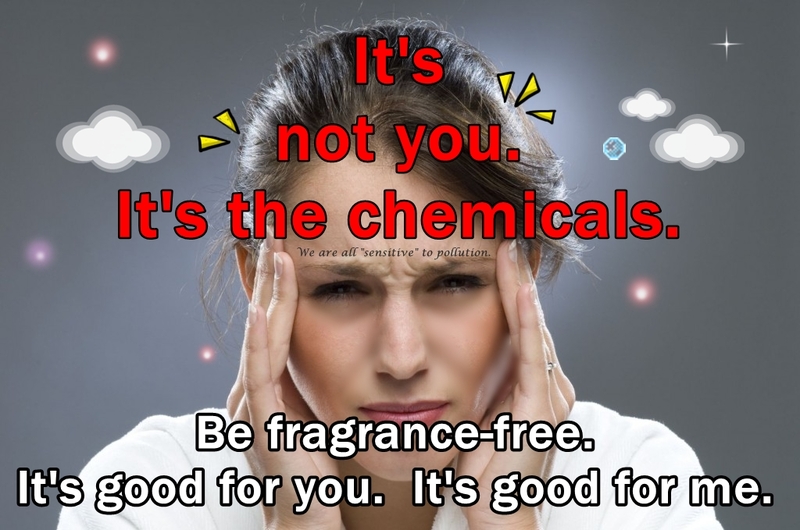 “Essential oils, widely used in society, emit numerous volatile organic compounds (VOCs). Some of these VOCs are considered as potentially hazardous under federal regulations. However, essential oils are exempt from disclosure of their ingredients on their label. 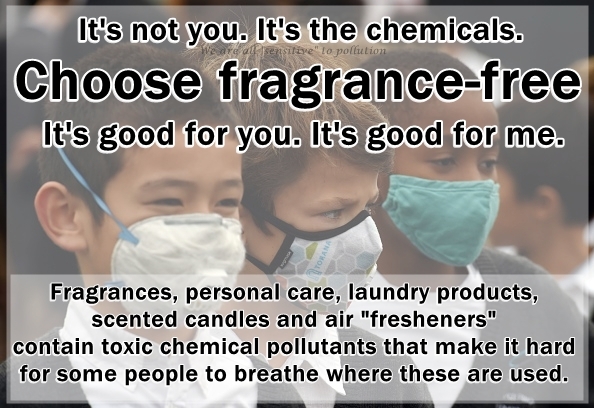 Thus, the public may lack information on emissions and potential hazards from essential oils. This study examined VOCs emitted from a range of commercial essential oils, including tea tree oils, lavender oils, eucalyptus oils, and other individual oils and mixtures of oils. Using headspace gas chromatography/mass spectrometry (GC/MS), the study analyzed 24 commercial essential oils, including 12 with claims of being “natural” or related terms, such as organic, 100% pure, or plant-based. 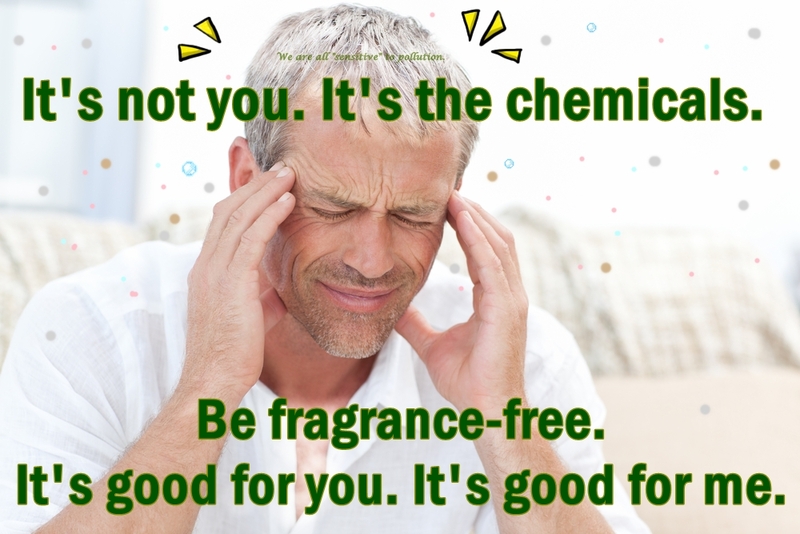 Results identified 595 VOCs emitted from the 24 essential oils, representing 188 different VOCs. The most common VOCs emitted were alpha-pinene, limonene, acetone, linalool, alpha-phellandrene, beta-myrcene, and camphene. Among the 589 VOCs identified, 124 VOCs, representing 33 different VOCs, are classified as potentially hazardous. All natural and regular essential oils emitted one or more potentially hazardous VOCs, such as acetaldehyde, acetone, and ethanol. Toluene was also found in 50% of essential oils. there’s something that can be used instead.